Vancouver's biggest ski and snowboard area, which was also host mountain of the 2010 Winter Olympics when four Canadian athletes took home gold medals on the mountain, is located just 30 minutes from downtown. Cypress Mountain has one of North America's largest Nordic cross-country ski areas with 19 kilometers of track set trails, 10 kilometers of self-guided snowshoe trails, and a Snowtube Park. 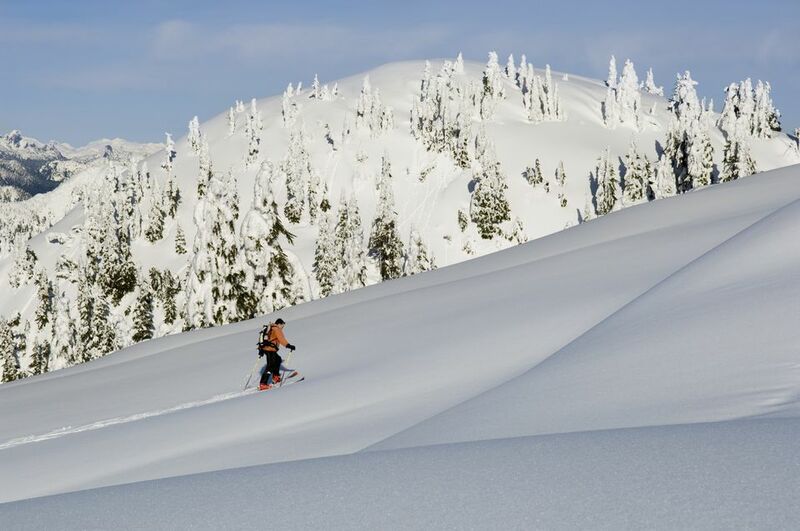 With 600 skiable acres and six terrain parks, the three mountains of Cypress (Hollyburn, Mount Strachan, and Black Mountain) have something for everyone, from serious skiers to snowshoers and those seeking a nighttime adventure. Cypress Mountain has 600 skiable acres, which feature 53 ski runs and a vertical rise of 610 meters (2,001 feet). Six terrain parks vary from small to XL features for all levels of skill. Advanced: Black Mountain offers the double black diamond Top Gun run, while Rainbow, Bowen, Slash, and Moons are scenic black diamond runs that attract advanced skiers and snowboarders. The District Park features L and XL terrain features for advanced tricks in the terrain park. Intermediate: Black Mountain's Crazy Raven blue run or Mount Strachan's Horizon trail are ideal for intermediate skiers and snowboarders. Head to the Skate Park early in the season just off the Eagle Express lift or Sunrise Park near the top of Lions Express to perfect your terrain park moves. Beginner: Green slopes include Panorama and Windjammer on Black Mountain or the longer and more scenic Collins run on Mount Strachan. Visit the Stomping Ground Fun Zone terrain park, right off the Lower Panorama run. First Timers: Take a group or individual lesson for a guided introduction to the slopes or visit the introductory terrain park Gnarly's Den and the nearby Easy Rider bunny hill. Buy lift tickets in advance to save money. For the 2018-2019 season, adult on-mountain lift tickets cost $79 (CAD) for a full day, $67 for 12:30 p.m. until close, or $53 for 'Nite Owl' tickets for 5 p.m. until close. Purchase a SkyCard or Gold Medal Card to receive lift discounts. Cypress Mountain is home to five eating establishments from full-service dinner spots to grab-and-go options. There are no overnight facilities at Cypress, but night skiing is available and apres-ski options are available. Crazy Raven Bar and Grill: Apres-ski (or hike) refueling can be done at the Crazy Raven Bar & Grill. Fully licensed with a wide selection of local wines, liquors, and beer—including Granville Island’s signature Crazy Raven Pale Ale—the full-service dining room offers everything from salads and apps to beefed-up burgers (including the mighty ‘quad’ burger). Open during winter time and peak summer, it’s the focal point of the mountain’s food scene. Cypress Creek Grill: Located on the second level of the historic-looking post-and beam-covered Cypress Creek Lodge, this open-concept food court serves up slices of pizza, grilled burgers, and warming dishes such as soup and chili. Open during wintertime only, the grill is fully licensed and sells a selection of beer, wines, and cider. Gold Medal Cafe: Located on level one of the Cypress Creek Lodge, the cafe is named to honor the four Olympic Gold Medal performances by Canadian athletes on Cypress Mountain in 2010. Grab a coffee or light breakfast here in the winter months before hitting the slopes. Hollyburn Lodge: Re-opened in 2017, the historic Hollyburn Lodge is nestled amongst the cross-country trails and is a cozy stop for chilly snowshoers and skiers alike. Stop here for sweet treats, burgers, and beers, or head there in the evening for more filling apps. Snowshoe fondue tours stop here for a warm up in the winter months. Nordic Cafe: Close to the ticket office and tube park at the entrance to the Nordic trails, this casual cafe serves up bagels and baked goods and is ideal for a quick refuel stop during a busy day on the trails (open winter only). Rent on the mountain and pick up everything you need from boots to a complete kit. HEAD skis and boots are designed for easier turning, super comfort, and faster setup time, plus snowboard boots feature the Boa speed lacing system or regular lace-up options. A full kit costs $47 (CAD) for a full day ($28 for kids) and includes skis, boots, and poles, or snowboard and boots (bring your own goggles and gloves). Rentals after 2 p.m. are discounted. Seasonal rents start from $149 (CAD) if you're planning to stay for a longer duration. Lessons are available for all ages and abilities and range from half-day sessions to private lessons (age three and over). Child group lessons (ages seven to 12) have six kids per instructor, and adult multi-day lessons have only six to eight students per class. Child Lesson Camps (ages 7-12): Full-day ski & snowboard camps for ages 7 to 12 for all abilities, including first-timers up to intermediate. Skooters Group Lessons/Camps (ages 3-6): The Skooters program features games and activities to help kids learn in a fun environment. Youth Lesson Camps (ages 13-17): These full-day camps cater to ages 13 to 17 for all abilities, including first-timers up to intermediate level. Hollyburn Mountain is home to the Nordic adventures area, where you'll find snowshoeing, tubing, and cross-country trails through the forests. Gnarly's Tube Park: Popular with kids (and big kids) of all ages, the tubing park has six chutes that are approximately 100 meters in length. A tube tow brings you to the top of the chute, and then it’s a free run all the way back down. All Tube Park participants have to be 42" tall or six years of age (whichever comes first), and children under the age of 10 must be accompanied by a paying adult. Snowshoeing: Hollyburn features 11 kilometers of self-guided snowshoe trails through subalpine meadows and forests, from easy to advanced. Guided tours include nighttime tours by headlamp or dinner tours with chocolate and cheese fondue stops at the historic 1920s Hollyburn Lodge, which was recently restored. Cross-country skiing: Cypress features 19 kilometers of groomed and track set cross-country ski trail, as well as 7.5 kilometers of trails lit for night skiing through the scenic Hollyburn Ridge forests.